Designing and deploying Amazon Cloud-based solutions to drive business. It's what we do best. 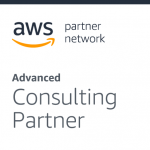 VoiceFoundry is among the first AWS APN partners to provide design, integration and implementation services to support customers migrating to Amazon Connect. 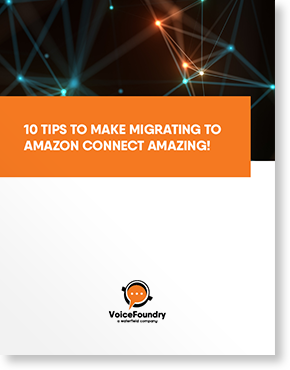 If you are deploying a cloud solution for the first time or migrating existing applications to the cloud, VoiceFoundry can help make your journey seamless. We are experts at implementing AWS services that range from speech solutions with Amazon Polly to the storage of massive amounts of data with Amazon S3 or chatbots with Amazon Lex. We have you covered. Amazon Lex simplifies the ability to support speech recognition and natural language understanding through conversational interfaces, also known as BOT’s. Our rich experience in building highly sophisticated IVR (voice) and ITR (text) applications enables us to provide sophisticated applications through best business practices and deliver a highly engaging and unique experience with lifelike conversations. Amazon Lex is the brain behind the Alexa personal assistant technology found in the Amazon Echo. Converting text into meaningful and natural sounding speech can be complex. We leverage the power of Amazon Polly to assist your team in developing applications which deliver customers a powerful lifelike voice experience with a total of 47 male and female voices across 24 languages. Our experts work with you and your team to create a unique experience based upon the customer’s profile or preference, enhancing their overall interaction with your company. Amazon CloudWatch is a monitoring tool that allows you to oversee your AWS applications to be sure they are running efficiently. It provides a real-time overview of how the applications are functioning, and whether resources are being used effectively. Amazon CloudWatch also has the ability to send notifications at designated thresholds, collect and track metrics in graph form and automatically react in designated ways to pre-set changes. With Amazon Simple Storage Service (Amazon S3) you can store and retrieve any amount of data from anywhere on the web using a simple web service interface. S3 is a highly-scalable, high speed and low-cost storage system that provides a durable infrastructure to store important data. Designed to be flexible and easy to use, Amazon S3 suits all sizes of business models, providing an important part of the infrastructure for organisations across every industry worldwide. Amazon Elastic Compute Cloud (Amazon EC2) delivers secure, scalable computing capacity in the cloud. It is a web-based service that allows developers to eliminate the up-front investment in hardware and instead focus on the formation of their application. EC2 is quick to navigate, with reduced time required to make new servers operable and scale either bigger or smaller. An added bonus is that you pay only for the capacity that you actually use. Amazon Lambda offers the option of running code only when it’s needed. It operates in response to specific events and then automatically manages the computer resources dictated by your code. There is no charge for the time your code is not running. With Amazon Lambda, you can run code for almost any type of application with no administration oversight required. After uploading your code, Amazon Lambda provides everything that is required to run and scale your code. With services such as Amazon EMR for a managed Hadoop framework and Amazon Redshift for a fully managed, petabyte-scale data warehouse, you can easily and quickly process and analyse large amounts data for ad-hoc analysis. Additionally, Amazon’s QuickSight provides the analysis and visualisation through rich dashboards enabling you to quickly and effectively gain valuable business insights from your data. Amazon’s Web Service Directory Service for Microsoft Active Directory enables directory-aware workloads and AWS resources to use managed Active Directory in the AWS Cloud. The Microsoft AD service is built on actual Microsoft Active Directory and does not require you to synchronise or replicate data from your existing Active Directory to the cloud. Standard Active Directory administration tools can be used to take advantage of built-in Active Directory features such as Group Policy, trusts, and single sign-on.